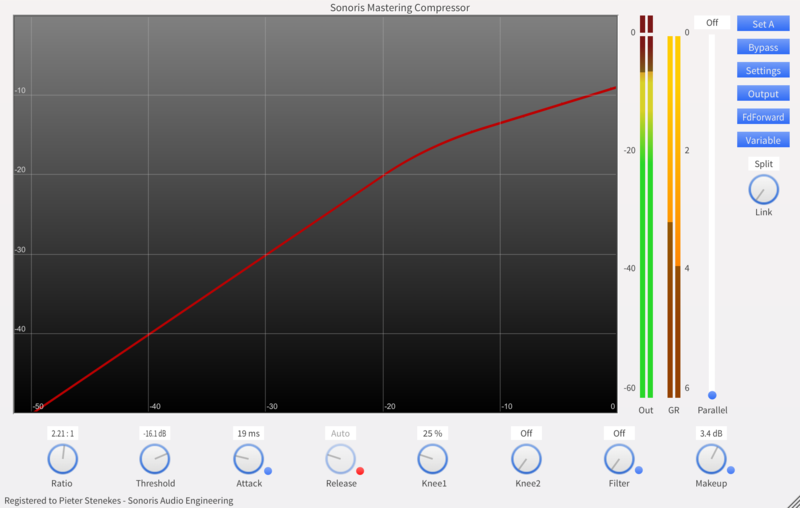 The Sonoris Mastering Compressor is a wideband mastering compressor in VST, VST3, AU, AAX and RTAS format for Windows and Mac. It is an ultra clean compressor suitable for delicate material. 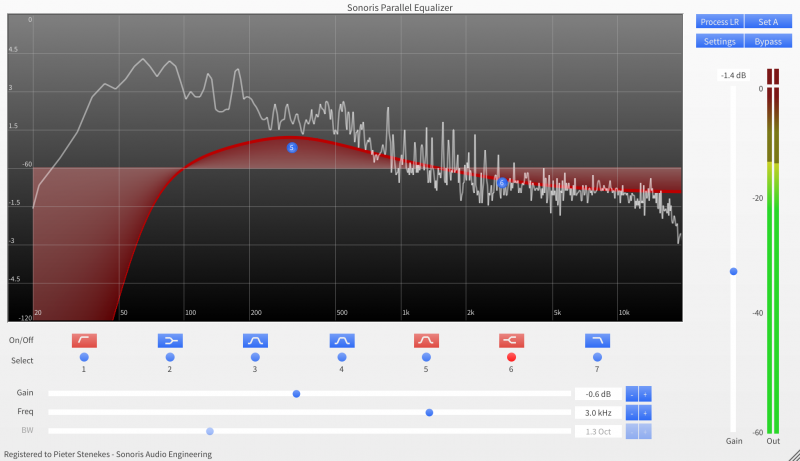 No odd harmonic distortion that can be found in most compressors, is present in the SMCP. 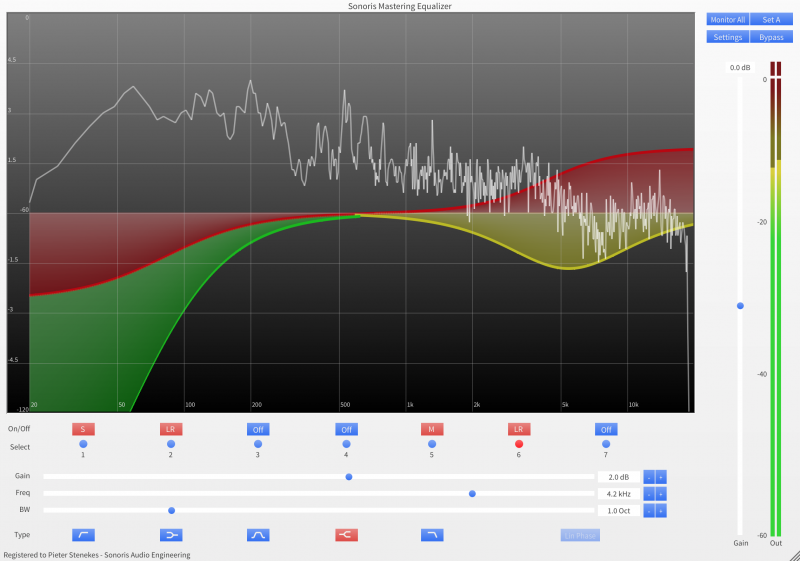 To reduce residual artifacts, the SMCP features upsampling of the audio up to 8 times. Transparency can be further enhanced by selecting auto-release and feedback detection together with two soft knees. If a more aggressive behavior is needed, you can choose feedforward detection with a harder knee. It can have some character if pushed. If needed, the audio can be warmed up by even harmonics with the flip of a switch. Besides working on a full mix, the SMCP can also work in split mode on the individual L, R, M or S channels or anything in between, with the variable link. The sidechain for each channel has a selectable high-pass, band-pass and low-pass filter. This gives great flexibility and allows for creative enhancement of the audio. Although I have used other digital processors with some success, I don’t think that any of them gave quite the same transparency of performance as the Sonoris. This is the best mastering compressor I’ve ever heard in the digital realm! Mastering Compressor represents a technological breakthrough: it’s the cleanest compression we’ve heard to date, and it’s capable of extreme punch when required. I am STUNNED by the quality of both the eq and the compressor, particularly the compressor. WOW.. I used it for mastering, SO transparent, it’s just like transparent glue and everything sounds exactly the same, just better and tighter. And then I used it with the HPF for deessing, and it was doing a better job than my $250 (…) deesser! There was no audible dip in the overall audio, just removal of the sss. Story: I regularly record one of Australia’s leading orchestras. For years I’ve been using a very good transformer & valve preamp on the main DPA4006TL mics. It just works in that hall, with this band, with these mics. I recently had a chance to demo the new uber expensive Schoeps preamps, which we recorded alongside my regulars. The resolution of the Schoeps was impressive, but there was some goodness missing, especially on the forte sections. On impulse I placed first one, then two instances of your compressor, just for the harmonic distortion alone (no compression engaged). Bingo! my colleague and I looked at each other – that’s it! All the resolution but now with the goodness. True story. I’m really excited about mastering my new album with it. It is “the” best mastering compressor I have ever used!